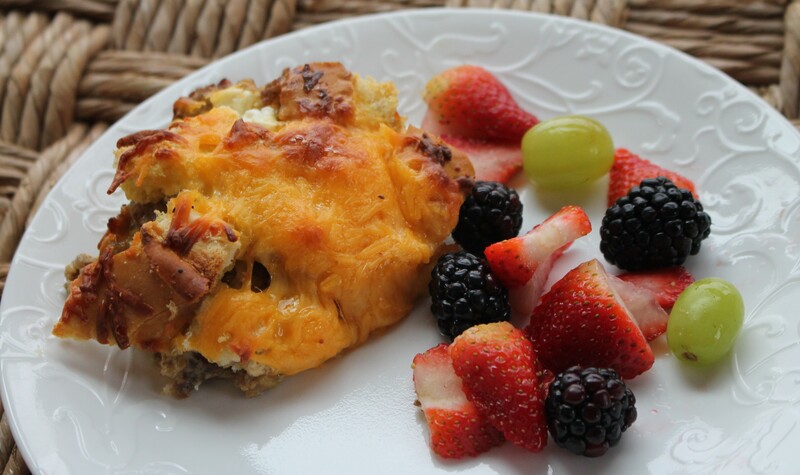 Breakfast casseroles are always a treat and easy peasy when you make it the night before. This casserole has a wonderful cream cheese surprise in many bites. Why have I never thought of that? Serve this dish with a wonderful fruit bowl, a cup of hot coffee (or tea), and wonderful conversation. Spray a 9×13″ extra deep baking dish and place 1/2 to 2/3 of the bread cubes in the dish. Crack eggs into a large mixing bowl, add cream, milk, salt and pepper. Whisk until smooth. Reserve 1 to 1.5 cups of mixture and pour remaining over the bread cubes. Spread green chiles on top of bread. Sprinkle with 2 cups of shredded cheese. Lightly press the bread down to aid in absorption of the egg mixture. Top with cream cheese, sausage and bacon, if desired. Top with remaining bread and pour reserved egg mixture over the bread. Sprinkle with remaining cheese. Sprinkle with a bit more salt and pepper, if desired. The next morning, preheat oven to 375 degrees. Bake on middle rack for 45-55 minutes or until the center is firm. Cover the bread pudding with foil about halfway through the cooking time and remove for the last 5 minutes or so.